This Calgary condo we staged is a perfect example. It had a somewhat awkward area located between the two bedrooms. When we started, the condo was vacant and completely unfurnished. Left that way, it would be hard for the potential buyer to imagine exactly how they would use that space. 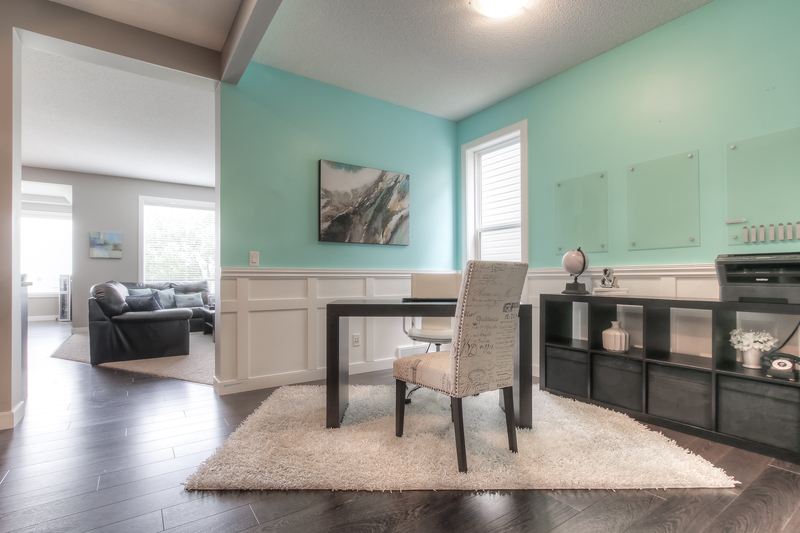 Because staging a home office zone is so important to potential buyers in this Calgary inner city neighbourhood, we knew exactly what to do. Now, with the addition of a rug, desk, chair, art, and accessories, it’s a dream space for anyone who spends time working from home. Just imagine looking out over the city scape, day or night, while you tap away on your laptop or make a call. It’s dreamy. That’s what you want your potential buyer to be imagining…NOT wondering what they would do with the space. Staging can create the wow factor that the potential buyer will remember. When you’re presenting your property in a way that will appeal to the needs and desires of your potential buyer, staging a home office will allow them to check a box off their wish list. Hiring a professional home stager with experience in that specific neighbourhood can create the WOW – the emotional connection that inspires potential buyers to become the new owners! Want to see more? Head on over to the Simply Stylish Staging Facebook page for more photos of the Calgary properties we have staged.